If there’s one thing that constantly irritates me it’s doing laundry and discovering yet another missing sock. Seriously, folks. 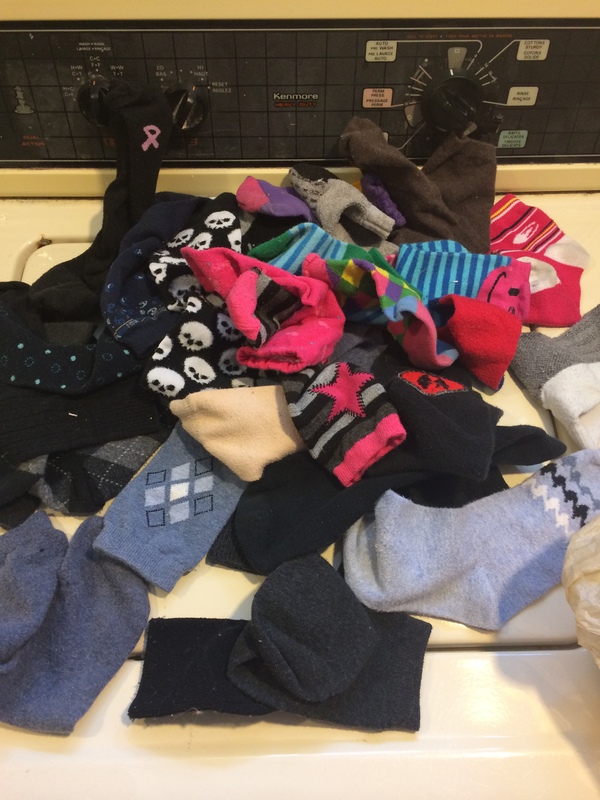 What the hell happens to socks in the laundry? I make every effort to ensure that when socks go into the washing machine, they go in as pairs. Yet, time and time again, by the time they’ve come out of the dryer, a sock (or three) is missing. No matter what I do, I cannot seem to shrink this pile. Today I made eight sets of socks happy. Eight! We have a sock bucket. The problem in my house is that my husband doesn’t care to match socks. He wears miss-matched socks and he puts miss-matched socks on our kids. I hate it! Doesn’t help diminish the sock pile thought! A sock bucket! Brilliant idea! I should try that. I find socks everywhere, under beds, under bookcases, most are from our 4 year old. How does he manage to get his socks off and how do they travel all the way to the back of the sofa? !